McKay Robertson (Left) and Anthony Hall talk about the day's recovery plans. 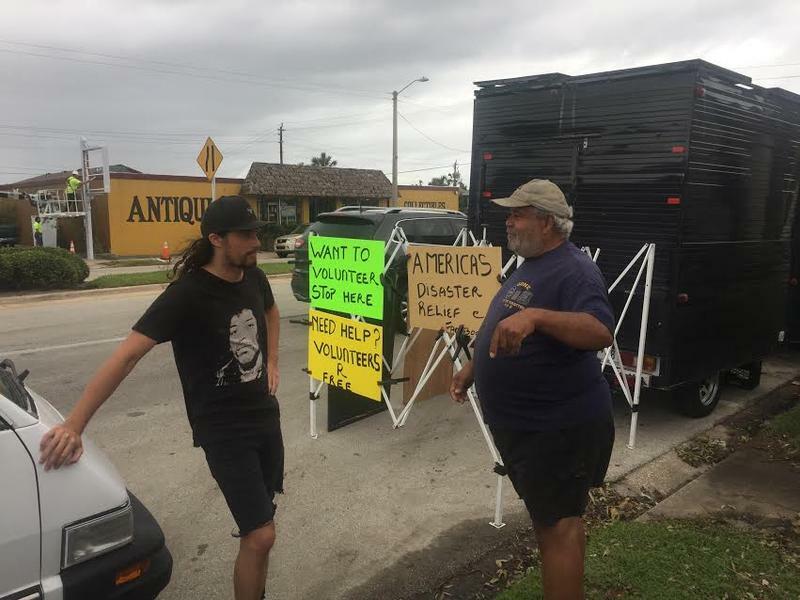 On Tuesday, Rhode Islander Anthony Hall is opening the back of his large, black trailer on the side of state road A1A just outside St. Augustine Beach. Inside are shovels, ropes and other tools to help people remove debris from their homes. He’s been volunteering in disaster recovery in one way or another since 9/11. “Well, I’ve managed for the last 15 years to just do volunteer work. I’m disabled, so I collect disability and instead of sitting home on the couch crying, I just go out and I do the best I can helping other people,” he said. Hall said he helped organize volunteers after the World Trade Center collapsed in 2001 and after Hurricane Sandy 11 years later. He was also part of recovery efforts after Hurricane Katrina and this year during devastating floods in Louisiana. Hall is a member of America’s Disaster Relief, a national nonprofit that coordinates volunteers when calamity strikes. McKay Robertson is one of them. “We’re just on a road trip, my wife and I and we were driving through St. Augustine, saw there was a sign on the road and thought we should help out,” he said. Hall said he’s already matched up a few families with volunteers, and he hopes build on that effort in the coming days. To find charities visit the Florida Department of Agriculture and Consumer Service’s Gift Givers Guide or Charity Navigator. Report suspicious charities on the Florida Attorney General’s website. OneBlood is urgently seeking donations after Hurricane Matthew caused several sites across Florida to temporarily shut down.